New technologies are revolutionising the use of remote sensing in agriculture. The widespread availability of low‐cost unmanned aircraft enables agricultural professionals to cost‐effectively gather crop health information. Imagery can be collected at resolutions measured in just inches per pixel. Data captured on a frequent basis enables growers and agronomists to map the health and vigor of crops today as well as observe changes in crop health over time. MicaSense delivers technologies that enable this revolution. Accurate information for your yields starts with quality sensors. MicaSense offers professional multispectral cameras optimised for use in drones: RedEdge® by MicaSense and Sequoia by Parrot. Featuring narrowband lters, calibrated outputs, and small size and weight, RedEdge and Sequoia coupled with MicaSense Atlas provide your complete multispectral remote sensing solution. Through drone-based sensors and analytics, MicaSense provides a complete solution that empowers growers to more effectively manage their crops. MicaSense RedEdge is the sensor that doesn’t compromise. RedEdge is a rugged, built-to-last, professional multispectral sensor that captures specific wavebands needed for accurate plant health analysis. With various integration options, it’s also one of the most flexible solutions on the market. 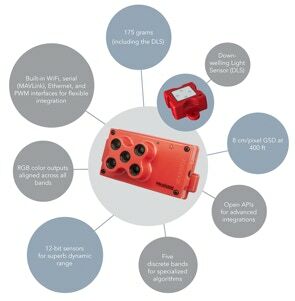 Additionally, optimized GSD, a downwelling light sensor, a low power requirement, and a global shutter for distortion-free images make this sensor the multispectral powerhouse. RedEdge is action-ready, integrating seamlessly no matter the platform. Versatile interfaces including built-in WiFi, Ethernet, serial (MAVLink), and PWM/GPIO triggers help turn a complex installation into a simple task.